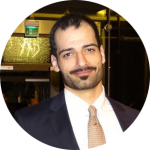 This is a guest post by Yousef “Yoyo” Abu Ghaidah, a PowerPoint ninja who founded Slide Cow, a learning platform for all things PowerPoint, presentations and public speaking. When he’s not designing slides or giving presentations, he’s on another coffee run. You can follow him on Twitter here. You probably already know that adding illustrations to your presentation content is a great way to communicate your message in a way that is fast, easy and effective. This especially makes sense when data comes into play. After all, data is just a bunch of facts or statistics that are collected together for reference and analysis. So, if you’re designing slides, it’s imperative you find a way to communicate data that makes it easy for your audience to process. Think about it, would you interpret a table full of meaningless numbers, or a chart that illustrates those numbers in a way that allows you to spot critical patterns and trends instead? I don’t know about you, but I value my time. I don’t want to look at a slide and play Where’s WaldoTM for five minutes when I already know there’s a better way. Data visualization isn’t just the process of slapping on a few charts. It’s about putting in the effort to help your audience understand the significance of the data that is being presented. What we’re trying to do here is to look for ways to make the data easier to comprehend. Doing so will make statistical relationships, patterns, and key trends become more exposed and recognized. And that’s where I come in! I’m going to help you with your data visualization techniques through a simple four-step guide. I’m going to be using the data derived from the first image in this post (the table with the stupid amount of data points). This way, you’ll see my thinking process put into practice and get a better sense of what I’m talking about. Once you’ve answered the what-who-how combo, you’ll notice the message you want to communicate starting to shape into something more valuable. Let’s put this method into practice. Refer back to the first image in this post. I have a list of the 50 most followed users on Twitter in 2017 and their follower counts. 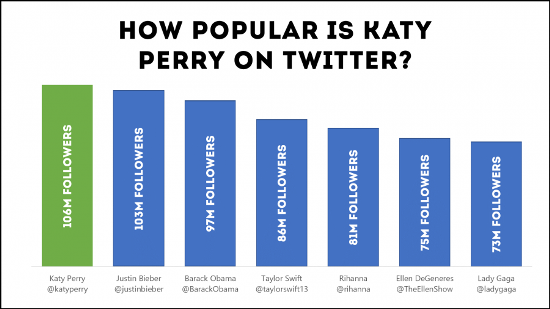 The story I want to tell is that Katy Perry is the most popular personality on Twitter in 2017, but isn’t too far ahead of Justin Bieber. The best way to do this is to either to use a bar chart or a column chart so that my audience can quickly identify the variances between each person listed in the chart. Now, let’s see how this looks like. Okay, I’ll be the first one to admit it. This doesn’t look too great right now. But don’t worry, that’s what the other steps are for. A common pitfall I see is the average presenter wanting to show off everything and anything. As such, this presenter will pack in every single data point into one slide. Oh, but it gets worse. The said presenter has no regard for the message; instead, he/she thinks it’s acceptable to blow everything off and let the audience figure it out. Your presentation is not about you, nor is it about what you did. It’s about making sure your audience has a path to receive your message as clearly and concisely as possible. So unless you want to set yourself up for a presentation full of yawns and audience members too busy looking at cat videos on the internet, then do not jam-pack all your data into your slide(s). You do not need to include everything. You only need to add the data points that are in line with the purpose of your message. Let’s put this into practice. In the first step, I found out that the best way to illustrate the purpose of my message was through a bar chart. As you and I can both see, there are way too many variables. I don’t need 50 data points to convey the purpose of the message. I’ll keep things simple by only illustrating seven. I’ve also noticed that there’s no need for me to have any labels on the Y-axis. I’m better off adding data labels so that the audience doesn’t take time matching the column to the number. Finally, I think it’s a good idea to make the columns thicker. This is just to make the interpretation of the chart as simple as possible. This looks better, but we still have a lot of work to do. Onto the next step! This is the most fun step of them all because now you’re going to be an artist! The aim here is to try and add visual creativity to add further purpose to your message. You only want to add creative elements that help provide context for what you’re trying to communicate. Do not add anything to your slide that distorts, or adds ambiguity to your message. 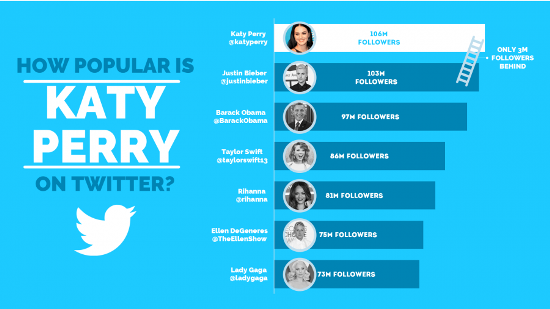 I understand that this can be a little complicated, so let’s use our Katy-Perry-fueled-Twitter slide to show you what I’m talking about. After looking at my purpose again, I noticed that there are two key takeaways from the statement. The first is Twitter, so I want to redesign the slide using Twitter’s color palette. The second is Katy Perry, so I want to make sure that the name is out there in huge letters. Let’s see what we have now. I think that looks great! 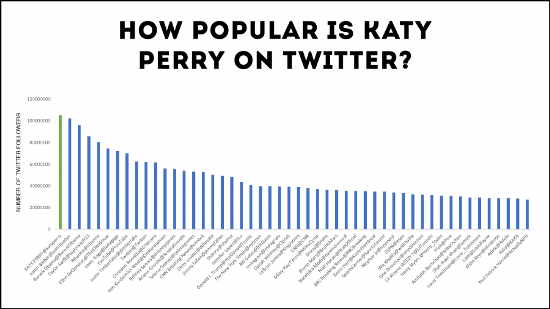 The flare I added allows my audience to immediately recognize that Katy Perry’s popularity on Twitter’s platform is the basis of the discussion, so it’s relevant. We can still do more though, so let’s jump to the final step. I’ll be honest; the fourth step is only for those who want to go the extra mile and aim to bring in every bit of value to the message. What you want to do here is review your slide and compare it to the three answers you provided in the first step. You want to look for ways you can bring in that little extra edge to make entirely sure your message is received and processed effortlessly. In layman’s terms, search for your wow-factor. In my example, I noticed that there are a few things we can do. 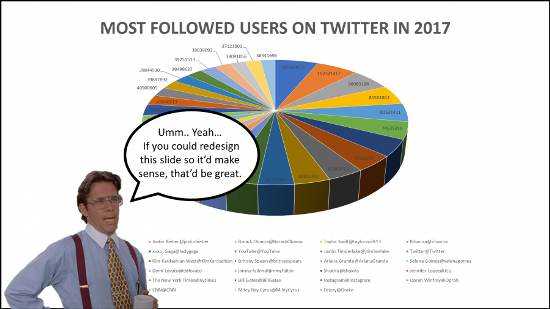 First, I noticed that more could be done to associate the slide to the Twitter platform. It’d be a good idea to add the Twitter logo into the slide, just underneath the heading to get a good tie-up between the text and the image. Secondly, I realized that my chart looks a little bunched up to the side. I figured it would be better if we changed it from a column chart to a bar chart. That way, I’ll have more space to play around with if I need to. Also, the text looks a little dry. I figured adding a few pictures to represent the Twitter personalities visually would do wonders. 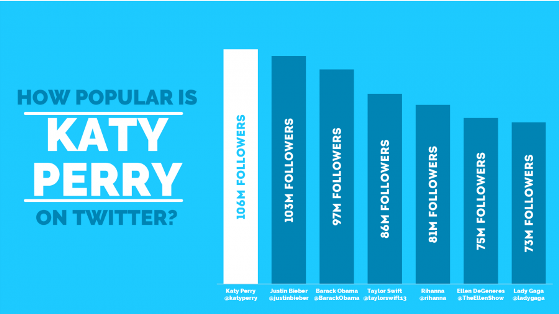 Finally, I added a ladder icon between the bars representing Katy Perry’s follower count and Justin Bieber’s. After all, my purpose was to highlight that although Katy Perry is winning the race, the Canadian superstar isn’t too far behind. To seal the deal, I added a few words highlighting just how far behind the Biebster is. Let’s look at the result. You know that feeling of satisfaction when you finish something great? That little sigh of relief followed by leaning back in your chair? All of this with a grin you can’t wipe off your face? That’s precisely I how I felt when I finished this slide, and that’s how you should feel too! Going the extra mile with data visualization techniques is what separates the veterans from the rookies. By following this 4-step guide, I’m pretty confident that you’ll exponentially increase the effectiveness of your presentations. 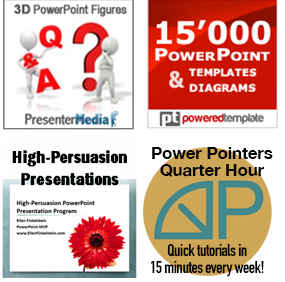 After all, what we’re after is creating a slide that your presentation audience wants to engage with. Would you follow these four steps to a T? Maybe skip a step? Perhaps add a step? Just let me know in the comments below.